App-oplexy is dedicated to the unbiased and in-depth review of apps on the iPad that support special needs children and adults. We understand the real life application of apps in the classroom. App-oplexy Founder and Editor Vicki Windman, is a Special Education teacher who was naturally drawn to technology. She sought any computer program sh e could find to help her students learn at an accelerated level. 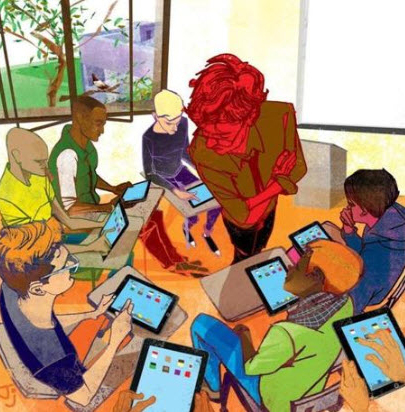 With the advent of the iPad and a few beginning apps that aided children with the basics of English and Math, she knew this would evolve into an exceptional teaching tool. Working with students individually, choosing apps tailored to their particular needs, she saw a new world opening up for Special Needs children. Ms. Windman received teacher of the year four times and received an award for most innovative teacher in 2011. She has been on local New York TV and radio stations sharing her experiences using the iPad with students with special needs. Vicki writes blogs for Tech and Learning Magazine and works closely with BridgingApps.org as they expand the use of technology nationally. Vicki has her Masters Degree in Education and is iPad certified by the Texas Computer Education Association (TCEA). She teaches iPad Certification Webinars for TCEA to parents, teachers and therapists. She also teaches use of the iPad to meet the Common Core Standards for IEP goals. Vicki lives in New York City and is the mother of two sons, Max, 25 and Ned, 21. Let’s roll back the to April 2010 and the introduction of the iPad 1. Personally, I had been waiting for this for years. One place to get “apps”, mail, write a document, have my calendar, take attendance all in this “tablet”. The rest of my colleagues were overwhelmed! Questions I commonly hear are What are Apps and how do I get them? Where do I find them? and, of course, How do I use one iPad for a whole class? I will address each of these questions below. An App is an application, or software. If you are Smartphone user you understand what an app is. The difference now is we are seeing new educational apps being added daily in the app store. Apps range from simple applications such as Faces iMake ABC by iImagine for $.99 to Write My Name by Injini for $3.99. Of course, there are more involved and expensive apps but overall you can get most decent apps for under $6.00. How to find an app? The app store located in iTunes has all of the apps. Personally, I find searching the store to be a very tedious task. Instead, I search using Google and YouTube. I decide on the topic and then sift through the apps. I read the reviews and, if there is a YouTube video, I watch to see how intuitive the app is. The lists of apps are endless, and you must do your research since there are many apps that claim to do something but after downloading them are pure disappointment. Finally, to answer How can I use one iPad for an entire class? There are a few options. First you need the VGA adaptor. The iPad 1 does not allow all apps to mirror. The iPad 2 mirrors all apps. Mirroring is the ability to see your iPad screen on a whiteboard or Smart board. In these situations, I use a lot of the book apps such as Lazy Larry Lizard bedtime story book for for preschoolers by Wasabi Production (free). There are a lot of interactive apps that allow students to take turns such as Storyrobe by Storyrobe, Inc $.99. The other alternative is having centers in your class and the iPad is just incorporated as one of your centers. This blog is going to be your safe place for you to ask questions, hear about the newest apps, read reviews of apps worth buying, Assistive Technology such as cases, keyboards, styluses, etc. We will have ebooks that will be mini handbooks to help you navigate through the move difficult apps. Yes some apps are more difficult and it’s okay to ask how to use it. Think of this blog as place you can come to daily to find out either about a new app or something exciting happening in education.